- AJW Grand Prix '85 (June) = Nakano competed in the league, which was won by Lioness Asuka. - AJW Denen Coliseum (August 25, '85) = Nakano & Dump Matsumoto won a "Three Falls" Match over the Jumping Bomb Angels. - AJW Dump vs. Chigusa "Hair vs. Hair" (August 28, '85) = Nakano, Monica Castillo, & Condor Saito fell to Jumbo Hori, Devil Masami, & Yumi Ogura. - AJW The Best Tag Team League '85 (October) = Nakano & Dump Matsumoto won the Semi-Finals Match over the Jumping Bomb Angels, then beat Lioness Asuka & Chigusa Nagayo in the finals to win the league. - AJW Japanese Tag Team Title Tournament (February '86) = Nakano & Condor Saito competed in the tournament, which was won by Kazue Nagahori & Yumi Ogura. - AJW Grand Prix '86 (May/June) = Nakano competed in the league, which was won by Yukari Omori. - AJW The Best Tag Team League '86 (October) = Nakano & Condor Saito competed in the league, which was won by Yumiko Hotta & Chigusa Nagayo. - AJW WWWA Tag Team Title League (March/April '87) = Nakano & Condor Saito competed in the league, which was won by Yumiko Hotta & Hisako Uno. - AJW Grand Prix '87 (June) = Nakano competed in the league, which was won by Chigusa Nagayo. - AJW The Best Tag Team League '87 (October) = Nakano & Condor Saito lost in the finals to Lioness Asuka & Chigusa Nagayo. - AJW Grand Prix '88 (June) = Nakano defeated Mitsuko Nishiwaki and Yumiko Hotta to win the league. - AJW The Best Tag Team League '88 (October) = Nakano & Dynamite Jack lost in the semi-finals to the eventual winners of the league, Mika Suzuki & Hisako Uno. - AJW Wrestlemarinpiad (May 6, '89) = Nakano pinned Yumi Ogura. Later on, Nakano won a "Two-Ring Battle Royal" Match. - AJW Grand Prix '89 (June/August) = Nakano defeated Suzuka Minami and Akira Hokuto, then lost to the eventual winner, Mitsuko Nishiwaki. - AJW The Best Tag Team League '89 (October) = Nakano & Beastie competed in the league, which was won by Mitsuko Nishiwaki & Madusa Micelli. - AJW Wrestlemarinpiad II (November 14, '90) = Nakano retained the WWWA Championship, winning a "Steel Cage" Match over Aja Kong. - AJW The Best Tag Team League '91 (October/December) = Nakano & Akira Hokuto lost in the Semi-Finals to Aja Kong & Bison Kimura. Kyoko Inoue & Toshiyo Yamada won the league. - AJW Wrestlemarinpiad III (November 21, '91) = Nakano & Monster Ripper fought in a "Steel Cage Texas Death" Match with Aja Kong & Bison Kimura (unsure about result). Later on, Nakano stayed the WWWA Champion, winning a "Steel Cage" Match over Monster Ripper. - AJW Wrestlemarinpiad IV (April 25, '92) = Nakano kept the WWA Championship, defeating Aja Kong. - AJW Night of Champions (July 15, '92) = Nakano retained the CMLL Women's World Title, pinning Akira Hokuto. - FMW Fall Spectacular '92 (September 19) = Nakano & Akira Hokuto beat Combat Toyoda & Megumi Kudo. - AJW Dream Rush (November 26, '92) = Nakano lost the WWWA Championship to Aja Kong. - AJW All-Star Dream Slam (April 2, '93) = Nakano & Aja Kong won over Eagle Sawai & Harley Saito. - AJW All-Star Dream Slam II (April 11, '93) = Nakano pinned Chigusa Nagayo. - AJW Legacy of Queens (August 25, '93) = Nakano, Suzuka Minami, Etsuko Mita, Mima Shimoda, & Bat Yoshinaga & fought in an "Elimination" Match against Miki Handa, Leo Kitimura, Yukari Osawa, Harley Saito, & Eagle Sawai. Nakano & Yoshinaga were the 'survivors'. - AJW Wrestlemarinpiad V (October 9, '93) Nakano & Reggie Bennett took down Yumiko Hotta & Suzuka Minami. - AJW The Best Tag Team League '93 (October/December) = Nakano & Suzuka Minami competed in the league, which was won by Akira Hokuto & Manami Toyota. - LLPW 1st Anniversary Show (November 9, '93) = Nakano & Takako Inoue fell to Otaku Hozumi & Shinobu Kandori. - AJW Wrestling Queendom (November 28, '93) = Nakano beat Hikari Fukuoka. - AJW St. Battle Final (December 6, '93) = Nakano, Etsuko Mita, & Mima Shimoda took down Cutie Suzuki, Plum Mariko, & Hikari Fukuoka. - FMW Year End Spectacular '93 (December 8) = Nakano defeated Combat Toyota. - AJW Wrestling Queendom II (March 27, '94) = Nakano & Aja Kong fell to Akira Hokuto & Shinobu Kandori. - JWP Ariake Coliseum (May 22, '94) = Nakano & Devil Masami beat Hikari Fukuoka & Sake Hasegawa. - LLPW Biggest Show (July 14, '94) = Nakano won a "Chain Death" Match over Shinobu Kandori. - WWF Summerslam '94 (August 29) = Nakano lost to the WWF Women's World Champion, Alundra Blayze. - AJW Big Egg Wrestling Universe (November 20, '94) = Nakano won the WWF Women's World Title from Alundra Blayze. 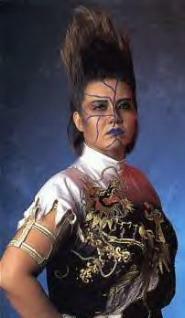 - AJW Wrestling Queendom III (March 26, '95) = Nakano retained the WWF Women's World Championship, pinning Kyoko Inoue. - NJPW Pyongyang Sports Festival (April 28, '95) = Nakano & Akira Hokuto won over Manami Toyota & Mariko Yoshida. - NJPW Pyongyang Sports Festival (April 29, '95) = Nakano lost to the CMLL Women's Champion, Akira Hokuto. - AJW Furitsu Gym (August 30, '95) = Nakano beat Lioness Asuka. - AJW Destiny (September 2, '95) = Nakano was pinned by Kyoko Inoue. - AJW Wrestlemarinpiad VII (November 18, '95) = Nakano & Lioness Asuka took down Reggie Bennett & Aja Kong. - WCW World War III '95 (November 26) = Nakano & Akira Hokuto defeated Mayumi Ozaki & Cutie Suzuki. - World Wrestling Peace Festival (June 1, '96) = Nakano & Neftali lost to Lady Apache & Akira Hokuto. - WCW Hogg Wild '96 (August 10) = Nakano was beaten by Madusa. - WCW Clash of the Champions XXXIII (August 15, '96) = Nakano again was pinned by Madusa.